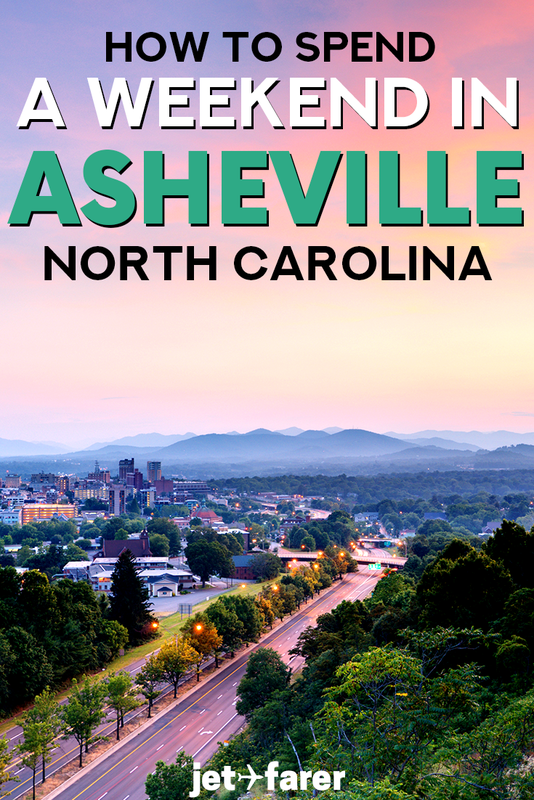 With charming neighborhoods, vibrant history, and beautiful surrounding mountains and hiking trails, Asheville is the perfect city for a quick weekend getaway. Once famous for being the home base of the prestigious Vanderbilt family, Asheville has since become an interesting oasis for artists, craft brewers, hikers, and more. And if you’re located on the East Coast, a weekend in Asheville can be the perfect trip, no matter what your travel style is. We recommend spending 2-3 days in Asheville to experience the highlights of the city and the surrounding areas. 2 days in Asheville is enough to catch a glimpse of this unique and historic city. With 3 days, you can tack on a short day trip to some of the state and national parks nearby to enjoy hiking and fresh air. Intrigued? Read on to hear our tips for a perfect weekend in Asheville, NC. With four seasons and a temperate climate, Asheville is a fantastic weekend destination year-round. 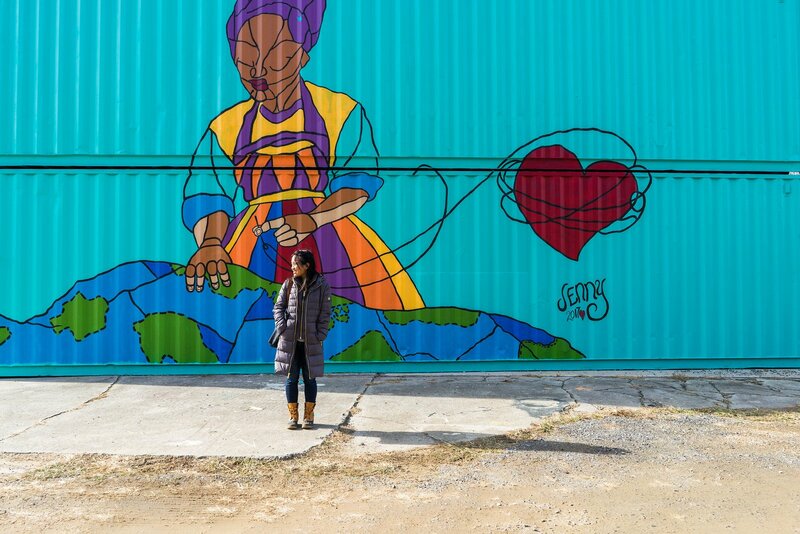 We spent 3 days in Asheville in the winter and, while it was pretty cold, we still got to experience the best that Asheville has to offer: we went hiking, ate delicious, locally sourced food, and hung out in quirky cafes. However, if you plan on spending most of your weekend in Asheville doing outdoor activities, it’s best to visit in the late spring to early fall to enjoy warmer weather and ensure the mountain roads will be open. Located in western North Carolina, Asheville is accessible by car from several East Coast cities. It’s about 7.5 hours driving from Washington, DC and 3.5 hours from Atlanta, GA. There are also several domestic flight arrivals from all over the United States at Asheville Regional Airport (AVL). Many neighborhoods in Asheville are walkable, but the best way to get around is to drive. There are so many beautiful mountain hikes near Asheville that are only accessible by driving, and you DEFINITELY won’t want to miss out on those stunning Blue Ridge views. If you need to rent a car, Hertz is our preferred, go-to car rental company, and you can easily pick up a car from Asheville’s airport. Visiting Asheville is similar most US cities, so pack as you normally would for a weekend trip. Keep in mind that since Asheville is in the mountains, it can be chilly during any season. A light thermal jacket – Asheville is in the mountains, so it can get chilly year-round. Bring a light puffer jacket like this one to stay warm while hiking. A rain jacket – Weather in North Carolina (especially in the mountains) can be extremely unpredictable. Be sure to bring a rain jacket so you can continue exploring, rain or shine! Hiking boots – There are TONS of gorgeous hikes in the immediate vicinity around Asheville, so be sure to come prepared with hiking boots. We recommend waterproof hiking boots (like these for women and men) in case the trails are muddy! Day hiking gear – Don’t forget your hiking gear so you can enjoy some of the most beautiful hikes on the East Coast. Read our complete post on what to pack for a day hike! Sustainable travel gear – As always, we recommend trying to cut down on plastic waste by using these portable sustainable travel items. Since it’s a popular tourist destination, there are plenty of places to stay in the city for 2 or 3 days in Asheville, ranging from major chain hotels to locally-owned boutique bed & breakfasts. Cozy Bed & Breakfast: For a cute (and totally Instagram-worthy) bed and breakfast option, head to the Cumberland Falls Bed & Breakfast, which is a gorgeous bed and breakfast in a Victorian house near downtown. Local Mid-Range Hotel: If you’re seeking a higher-end, local boutique hotel option, the Princess Anne Bed & Breakfast is a charming and cozy hotel/B&B hybrid that has cozy rooms and great amenities, and of course, it includes breakfast. Budget Guest House: If you’re looking for a budget-friendly guest house, the Asheville Hostel & Guest House is beloved by travelers and is within walking distance of some of the best bars and restaurants in the city. Perfect for backpackers or solo travelers! It’s your first full day in Asheville! Take this day to wander around the city center and soak in everything this fun and unique city center has to offer. Once you wake up, grab a quick breakfast and a coffee at the Green Sage Cafe. Their drinks and vegetarian options are to die for (yes, even my meat-loving boyfriend adored them!). After that, you can begin wandering around the city. Some of the best hidden gems can be found simply by exploring on foot. For a more structured morning, you can join a guided city tour of Asheville to help orient yourself to the city. Afterward, check out some of the colorful streets, or drink champagne and read a book at the Battery Park Book Exchange. In the early afternoon, head to the River Arts District, which boasts a street full of colorful art galleries with work by dozens of local artists. Here, you can find home furnishings, paintings, jewelry, sculptures, and more made by local artists in these eclectic, refurbished warehouses by the water. To unwind from your long day in the city, head to Rhubarb, one of the city’s most incredible farm-to-table gems, to enjoy a house-made cocktail and some fresh locally-sourced dishes. If you’re seated near the back of the restaurant, you can watch the chefs create their farm-to-table concoctions – pan searing fish, braising pork belly, and chopping vegetables – in the open kitchen. Afterward, head to a bar or music venue to experience some of Asheville’s buzzing live music scene. Or, if you’re up for being spooked, try a walking ghost tour of Asheville, which takes you on foot to many of the haunted historic sites in the city, sharing spooky ghost stories along the way. Start your day off with brunch at one of Asheville’s esteemed brunch institutions. Our personal favorite was Over Easy Cafe, a delicious southern comfort food joint with incredible savory dishes. We had some amazing Bloody Marys there as well, in case that’s your thing. Next, head over to the Biltmore Estate. I’m not going to lie – it’s pretty expensive to get in, so I opted to just hang around Biltmore village and see it from afar. The village nearby has lots of little shops and cafes, and it’s a cute place to spend a morning sipping coffee and walking around. However, if you enjoy these kinds of historic homes, grandiose architecture, or simply want to learn more about the Vanderbilt legacy, the Biltmore is one of Asheville’s most iconic sights and will definitely be worth it for you. If you decide to go inside the Biltmore Estate, I recommend getting there early so you can take full advantage of the ticket price. I suggest avoiding eating lunch there, since the restaurants are super expensive and you can find great food elsewhere. After the Biltmore, grab lunch at a traditional North Carolina barbecue joint. Some of Asheville’s most famous BBQ restaurants include Buxton Hall BBQ or Luella’s Bar-B-Que. North Carolinians will argue that their BBQ is the best in the world, so if you’re from out of state, you really can’t miss this regional delight. For an unforgettable sunset view, head to Black Balsam Knob trail in Pisgah National Forest. It’s only about a 1-1.5 hour drive from Asheville, then a 10-15 minute easy hike to the summit, which boasts amazing views into the surrounding ridges and valleys below. In the summer, you can set out a picnic blanket and enjoy the last few rays of golden light to end your trip in the most beautiful way. Sunsets on Black Balsam Knob are GORGEOUS! It would be a shame to spend a weekend in Asheville without taking full advantage of the beautiful nature near the city. For your third day, I’ve laid out three day trips/excursions you can do, depending on your interests and how much time you have! Hickory Nut Gap Farm: An animal and produce farm located in Asheville, Hickory Nut Gap Farm offers tours around its grounds as well as a shop with all kinds of locally-produced goodies. Killer Bees Honey Farm: See how local beekeeping is done and taste delicious honey snacks in this farm and boutique shop. Altapass Orchard: A cute apple orchard where you can buy locally-made apple products year-round, or go apple picking during the fall (September and October). This place is perfect for viewing the fall foliage, too! If you’d prefer to see nearby farms on a guided tour, Asheville Farm to Table Tours has many different ones to choose from. Take some time to explore the nearby state parks. Located in the heart of the Blue Ridge Mountains, Asheville has no shortage of hikes or outdoor activities. It’s worth taking a day to explore Pisgah National Forest, Linville Gorge, Chimney Rock Park, or some of the nearby waterfalls in the Blue Ridge. Alternatively, you can rent a stand up paddle board and explore the regional nature from the water. Located less than 2 hours from Asheville is Great Smoky Mountains National Park, which encompasses the Blue Ridge Mountains and parts of the Appalachian Trail. If you love the outdoors and are spending a weekend in Asheville, tacking on a trip to the Smokies is a great idea. Especially beautiful in the early mornings, when the fog weaves through the mountains, it also makes for a perfect day trip from Asheville. Drive over to the park and tackle one of its many hiking trails, or simply road trip through its main roads to catch a few beautiful views. Have you ever visited Asheville, NC? What were your favorite activities there? Join the conversation on our Facebook group, where you can get customized travel tips and inspiration from our very own Jetfarer travel community members.